How are you supposed to know where you're going if you don't know where you are? Position is greatly undervalued by every beginner poker player. Your table position is often the difference between winning a hand and losing one. Before playing a hand in Texas Hold'em you should always be aware of your position relative to the dealer button. Take a look at your position before you take a look at your cards. The seats nearest to the right of the button are called late position or LP for short. The seats in between these will be called middle position or MP. You win more money from later positions than you do from early positions. The player on the button acts last, makin the button the most profitable position (over the long run). Early Position is least favourable because you'll be one of the first to act after the flop. You want to avoid playing weak cards from these positions. You're relying on your cards to help you win the pot, as being first to act throughout the hand gives you less opportunities to outplay your opponents. Don't get yourself in to trouble from EP. Middle Position is better than Early Position, but it's not as awesome as Late Position. You can afford to play a few more hands from MP than you would from EP, as you do not have as many people left who can call and act after you from the flop onwards. However, if all of the players from Early Position fold, this will still mean that you will be the first to act on each round. When it comes to poker strategy, it's not so much about your seat at the table as it is about who you've got acting before you and who you've got acting after you. Late Position. is highly advantageous. There is a high chance that you will be last (or one of the last) to act on each round. This is so powerful it means you can be far more flexible with the range of hands you play. Just remember, just because you have position it doesn't mean you can get away with playing absolute junk all of the time. 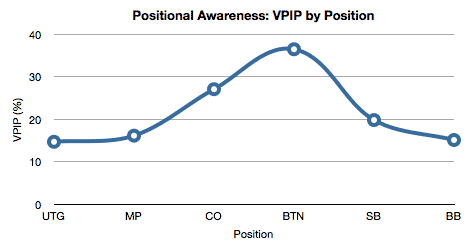 "Being in position", "having position" and "positional advantage" all mean the same thing. Although it probably makes more sense to think of a positonal advantage as an informational advantage. The 'cut-off' is the position just before the button. This is the second best seat in Texas Hold'em because if the button folds, you will be the last to act on each hand. 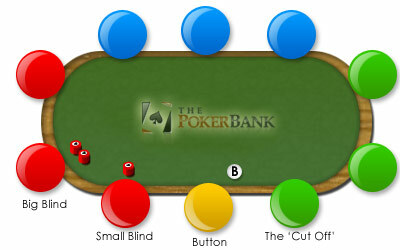 The button and cut-off are very useful positions for stealing the blinds as there are less players to act behind you, which makes it less likely that they are holding a good enough hand to call a raise with. How to use table position in poker. If you have position over another player, it means that you are acting after them on each round. This means they will give you information before you make your decision. They could check - possibly a sign of weakness. They could bet - possibly a sign of strength. If they bet, the size of their bet could mean something. The time it takes for them to make their decision may also give you extra clues. For example; if you have position over your opponent and they check quickly, this could be a sign of weakness. So you could use this information to bet out and take the pot. It's not always this easy, but getting some kind of information is infinitely better than being the one giving information to your opponent. Lets say you're on the flop with a bunch of players in the pot, and you hold a mediocre hand like middle pair. If there's a lot of betting and raising before the action gets to you, you can be sure that your hand isn't the best and you can happily fold without losing any chips. On the other hand, if you are in early position you may bet out with a decent hand, only to find that there are much stronger hands out there that will re-raise you and force you to fold. Therefore you will have lost chips due to a lack of information. The later you act in a hand, the more information you will have available to you about your opponents. In general, you want to play more hands in position than you do out of position. This doesn't mean that you force yourself to play any old hand when you have good position. Instead, be more inclined to play a wider range of hands when IP, but don't play this wide range of hands when OOP. Try not to think of your position as dictating which hands you can and can't play. Instead, think of it as taking advantage of being last to act as often as you can. In early position I would be reluctant to play KJo. It's on the low end of the "good hands", and the fact that I have poor position makes it an unattractive situation. The hand isn't strong enough to counteract my positional disadvantage. In late position I would raise this hand almost every time if there were no raisers before me. I may also call raises with this hand if I have position on the raiser. I have an advantageous position combined with a decent starting hand, so the situation is looking good. As a beginner player it's tricky to get to grips with the hands that are okay to play in LP, but are not good to play in EP. How are you supposed to learn the subtleties of which starting hands to play in which positions? Trust me, you will pick it up as you go along. It will take time, but the more experience you get under your belt the more you'll get to grips with it. If you're completely new to the game, there's no harm in sticking with the premium hands and entering pots with them irrespective of position – that's okay. Just be prepared to broaden your starting hand requirements based on position as you improve. Following on from my last point about playing more hands in position, here's a graph that shows a winning player's VPIP based on their position in 6max cash games. A graph to show the positional VPIP of a winning 6max cash game poker player. UTG - This is the seat to the left of the big blind. This is the first player to act preflop. MP - This term can to varying positions between early position and late position. In this example it is the seat to the left of the UTG position. CO - The seat just before the button. This is the second best position in the game. BTN - The best seat at the table. This player acts last on every postflop betting round. Notice how this player is playing a lot more hands in late position than they are in early position. They do not play the same set of hands from all positions. They're not forcing these statistics either – they're just wisely taking in to account their table position and then selecting which starting hands to play with. You can find out your own VPIP stats (and also those of your opponents) by using the popular Poker Tracker software. Table position is easily one of the most underestimated factors in playing a hand by many amateur poker players. Position is so important that often hands can be won or lost based on your position alone, irrespective of the strength of the cards that you and your opponent hold. The sooner you start paying attention to your position, the sooner you will start making more money. A useful article to read from here is starting hand selection, as it highlights how you should stick to playing only the strongest hands from early position due to the big disadvantage of having to act first on betting rounds.